You’ll know it – the principle of Leave No Trace (LNT). It’s a hot potato, and we do everything we can to get the message across. Lots of you hear it, some, not so much. 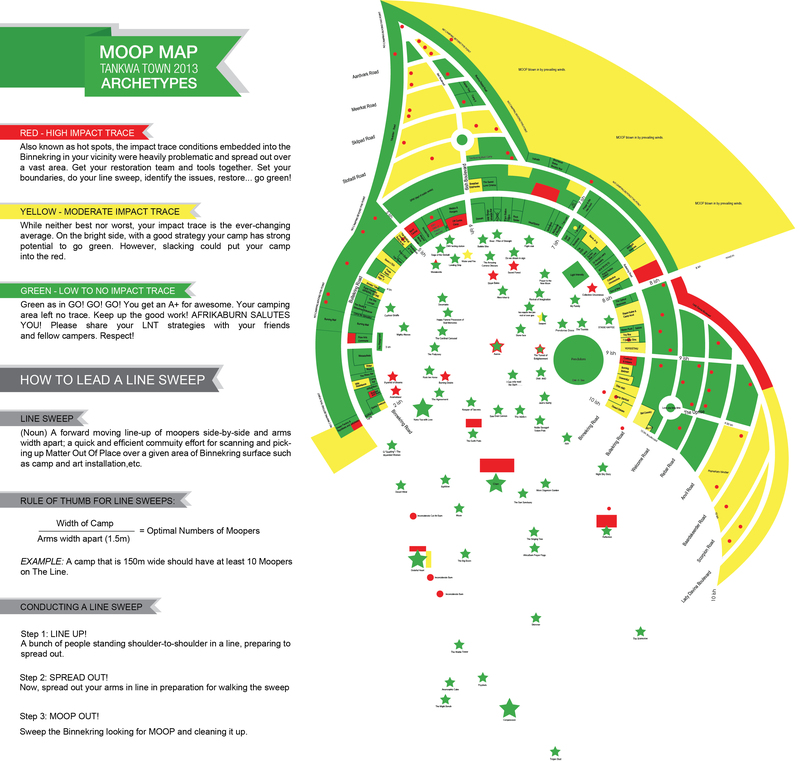 So, without and further ado ladies and gents, boys and girls, gather round and lay your eyes upon AfrikaBurn’s very first Moop Map! Yes, you read that right – here, in all its glory, is the full detail of where our dedicated Moop volunteers detected Moop, or in some areas, none at all. It’s all pretty self-explanatory (ie: green is good, yellow is not so good and red is ‘What the hell?’), but for a full explanation, see the map itself (click to enlarge). To find out how exactly the Moop team went about determining who’s been naughty and nice, read the info below the map. And hey, if you’d like to get involved with Moop at the next event, simply email [email protected] and you’ll be welcomed like a long-lost relative! Like to view it in full high-res glory? Just click it. The Moop Map gets created in the week post-Burn. First we go out and survey the entire area, with maps, cameras and notebooks in hand, plotting and marking the Macro Moop (this includes anything large enough to spot from a distance of 3 meters) left on site. Then when this is done, we form a massive line up with about 30 or so people in a lineup and walk the map from one end to the other in a grid pattern, picking up all the Micro Moop (the small stuff – about 8 barrels’ worth after all was said and done this year), cleaning all the open fires debris away, checking all the art sites and cleaning them (by raking coals and sweeping them with a magnet sweeper) where needed, and generally making sure no trace is left behind. A rating is then collectively passed over every camp and art site as we are finished, getting the perspective of all 30 participants. We then compile this information, recording it digitally and graphically. As the process finishes we send out Moop letters to all the camps first, award the the best Artwork site Restoration Awards and lastly we publish the map. The red dots on the map represent either Macro Moop (think everything from bags of garbage to cars, yes cars) left behind or open fires. Open fires account for nearly 80% of the dots and is our biggest issue. Open fires create burn scars and are a fire hazard. Open fires are NOT ALLOWED at AfrikaBurn. Please use Burn barrels or raised braais at least 30cm of the ground. The red blocks close to some artworks are dancefloor areas, these being an absolute disaster area on the mornings after the Burns and which subsequently had to be raked by hand to turn up all the micro MOOP such as cigarette butts, earrings, fake eyelashes and other odds and ends stomped into the ground. Don’t let it hit the dance floor! ‘To Nana-Yaa with Love’ left their site absolutely spotless. Thank you for the great effort made and a most beautiful burn! Respect! ‘Compression’ also left their site beautifully raked and cleaned with metal sweepers. Thank you and Respect! The Grateful Heart was a gigantic burn and the team cleaned up very nicely after themselves! They also made the effort to communicate their process as this took several days. Well done and Respect to you! The Aurora Dome was left spotless and has a green rating BUT the people who came to enjoy the Dome left at least 8 bags of trash in the Dome! Sies! Your Moop is nobody else’s responsibility – especially the artists who worked hard so you could enjoy yourself. Pack it out, play, pack it back in!! The Tunnel of Enlightenment get a red lining because they swept the desert floor which is not permitted at AfrikaBurn. Collective Unconscious burnt their art work in a spot not allocated to them, therefore creating a new burn scar that was not previously there. They did clean up nicely, but if we all just burn where we wanted to, we’d create one huge burn scar on the surface of the Binnekring. Wonderville had some one dump their open fire contents onto the middle of their burn. This also happened at the Clan Burn where we found bamboo poles dumped onto the Clan site. This did not burn away and created more work and MOOP. Secret Forest did not fasten their plastic leaves securely, creating a lot of micro Moop. Please secure all parts of the art work to withstand the gale force winds which we deal with in Tankwa. The Straw bales, or ‘Roadkill’ was not cleaned away. Straw is not indigenous to the Tankwa landscape and therefore considered Moop. Burning Desire: the letters we not cleaned away and racked after burning and there was some chemical compound in the center piece which left a horrible mess on the Binnekring which was hard to clean up effectively. Anamalsaur and Pyramid of Dreams: Not raked, left over unburnt wood and rubble. Inconsiderate burns are burns that were not registered and so not scheduled. This is completely inconsiderate of the Tankwa environment and inconsiderately disregards the challenges the Health and Safety team face trying to protect Tankwa Town from danger. Please: Just. Don’t. Do. This. Register your artwork, confirm you’d like to burn it, and we will put the proper plans in place for a safe burn that does not permanently scar the desert surface. Inconsiderate Art Car Burn was literally a fly by the seat of your scooter (yes we saw you), drop, set alight and go – without supervision, foresight or insight. Yes we found your axle and no you can’t have it back. If you going to act like this, we won’t be supporting you to do it again.